It’s weird to leave your house in black fishnet stockings, a small black dress, and tall black suede boots in broad daylight. The neighbors look twice. 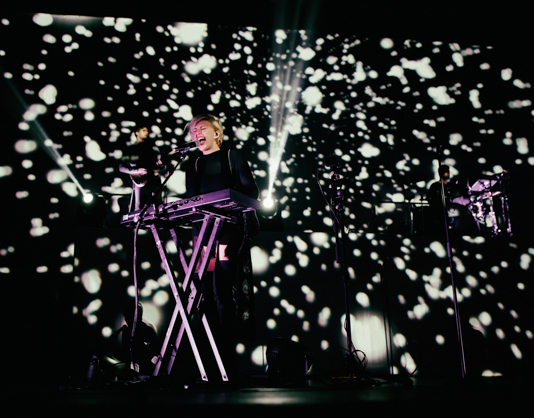 But when the sultry, electro-rock group Phantogram comes to Santa Barbara, you better look the part. Just off the first weekend of Coachella, the duo was fresh and full of energy as they performed in front of a completely packed house at the Arlington Theater. Recently transformed into a platinum blonde, Sarah Barthel epitomized the glamorous rock vixen clad in tall leather boots and not much else, while Josh Carter remained true to his jeans and cap. The large crowd itself was an eclectic mixture of casual and over-the-top rock outfits that made people-watching in the lobby a true sport. 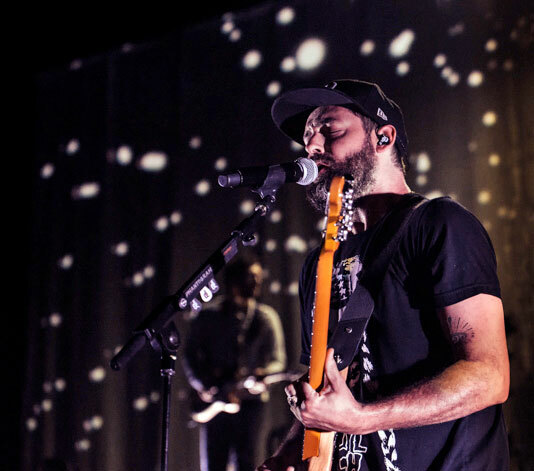 Phantogram is touring in support of their third studio album, aptly named Three. The duo’s sound has matured and solidified over the years, and they are now quite an impressive live band. 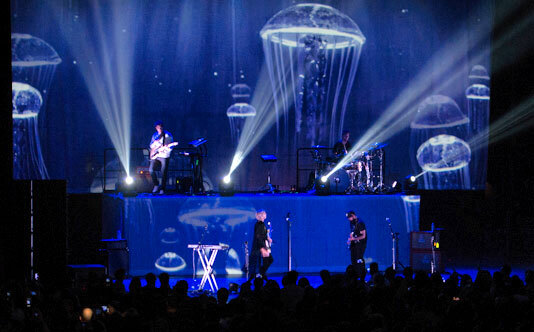 Named after an optical illusion in which 2-dimensional images appear to be 3D, Phantogram brings this illusion to the stage with them with intense light imagery splayed across the entire set reinforcing the intensity and depth of the music. They hit the stage hard with their narcissistic song, “You’re Mine,” heavy on the beats and dark lyrics. Easily moving into “Same Old Blues” and newly added to the set-list “Run, Run, Blood” off Three. It was impressive how Phantogram stayed true to the newer songs, interweaving older songs in the middle including “Black Out Days,” Fall in Love,” and “When I’m Small,” and ending with Josh’s newer solo song “Barking Dog,” followed by “Cruel World” and then finally the big hit “You Don’t Get Me High Anymore,” they effortlessly created a set that moved from new-to-old to-new again.